Such a beautiful place! We go there every year. I'm so jealous. Be sure to have a frozen mai tai! Wonderful pictures- thank you for sharing with us! I could tell which hotel from the picture in a previous post, because of the rock formations i the water. 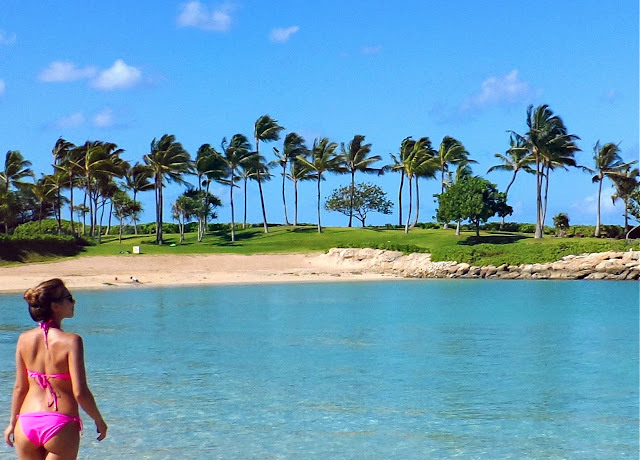 I agree that Ko'olina is just beautiful. wow! such a great view! happy summer Annie! I was so surprised to see you're in Hawaii! It's my home and I'm so glad you get to enjoy and experience it. :) I just had to comment when I read you're here. I recently discovered your youtube channel and website a month or two ago and have become such a big fan. You're so pretty and have a beautiful spirit about you. I hope you get a chance to check out the North Shore of Oahu! Sunset Beach is my favorite spot. Happy Belated Birthday! glad you are enjoying your 23rd birthday and your trip to hawaii! I am currently visiting the mayan riveira in mexico and it is also absolutely beautiful! What a coincidence that we are vacationing the exact same week! I can't believe you're on Oahu!! I'm from Honolulu, which is pretty much the opposite side of the island from where you're at! Haha. Happy birthday and hope you have an amazing time! Lovely pics. The weather in Estonia is awful.